You can guess the shape of Half Moon Bay from its name—a crescent-shaped piece of California coast with a nice little town in the middle. It's more laid back than its southern sister Santa Cruz, with a quiet ambiance and rural feel. Half Moon Bay is popular with families, those who like to be active outdoors, and area locals out for a nice day's drive. It also offers some nice opportunities for wine and food lovers. Half Moon Bay weather is best in spring and fall. In summer, it's prone to fog and in winter, storms and high surf are likely. Don't miss this: If you've only got a day, downtown Half Moon Bay is good for a leisurely stroll. The five-block-long shopping area on Main Street is lined with shops, galleries, bookstores, a winery tasting room, and several restaurants. Don't miss the murals painted along the side streets. Beaches: The best spots for tide pooling are the Fitzgerald Marine Reserve (north) and Pescadero Beach (south). Active outdoors: Take a long hike following the Coastside Trail, which follows the ocean bluffs between Pillar Point Harbor and Poplar Avenue. If you'd rather take to the water, California Canoe and Kayak and Half Moon Bay Kayak Company rent kayaks and offer lessons and tours. Sea Horse Ranch offers trail rides on the beach every day, except when it's storming, and you don't need a reservation. Just drop by (wearing long pants and close-toed shoes) and they'll do the rest. Children ages 5 and up can ride, and you can always find a horse that meets your needs whether it's your first ride or your hundredth. A wild time: December through March, thousands of northern elephant seals haul out of the ocean onto the beach at Ano Nuevo, a few miles south of Half Moon Bay. Babies are born, males fight for dominance, adults mate, and the pups stay behind until they learn to swim well enough to take to the sea. Side trip to Pescadero: It's just a few miles south off of California Highway 1, with a cute little downtown and a bakery that makes some of the best artichoke bread you'll find anywhere. The few shops in town are good for a rambling browse, too. Family fun: Kids like the beach, tide pooling and the pony and train rides at Lemos Farm. The Ritz-Carlton Half Moon Bay is also one of the most family-friendly hotels around, serving hot chocolate and S'Mores around their outdoor fireplaces and offering a wide range of children's activities. Cork and Bottle Days: Several times a year, La Nebbia Winery has its Bottle and Cork Days. Bring your own clean bottles (or buy some from them) and they'll fill them up with premium wine and cork them for you, for a price almost anyone can afford. They're on CA Hwy 92 east of Half Moon Bay and their tasting room is also open daily. Mavericks Surf Contest: Any time the waves get big enough during competition season (November through March), the word goes out - and the world-class, big-wave surfers have just 24 hours to the there. Pacific Coast Dream Machines, April: Vintage warbirds, unicycle drag racing, monster trucks, motorcycles and all kinds of "dream machines" show up at this weekend festival. Farm+Fish+Flowers, July: This day out offers behind-the-scenes tours of local nurseries, wineries, and farms, many of which are not ordinarily open to the public. Pumpkin Festival, October: Half Moon Bay runs one of the biggest Halloween-time festivals in the area, with a pumpkin championship and lots of activities. During popular events and on nice weekends when local residents go out for a drive, you'll find the roads getting to Half Moon Bay jammed. There are only a few ways to get there, so you'll need a big dose of patience, plenty of fuel, and an empty bladder. Half Moon Bay has many nice hotels in a wide price range. If you'd like a place that's a little more like home, try a vacation rental. 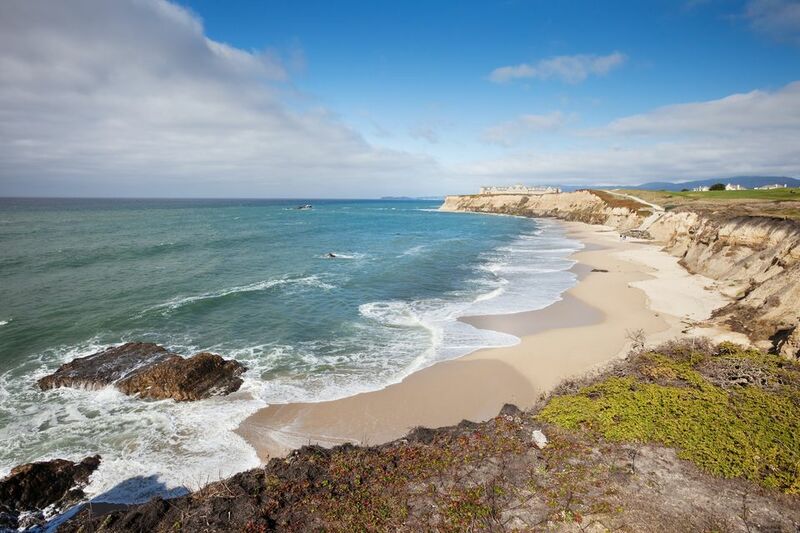 Pelican Point RV Park at 1001 Miramonte Road is a good spot for campers, or try Half Moon Bay State Beach. Where Is Half Moon Bay? In this case, getting there is half the fun and the drive to Half Moon Bay from anywhere can be scenic. Half Moon Bay is located 30 miles from San Francisco, 40 miles from San Jose, and 115 miles from Sacramento. If you're going for the weekend from San Francisco or San Jose, get there via I-280 and CA Hwy 92 West, then take a slow drive home via CA Hwy 1.